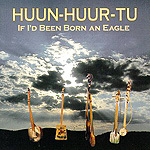 CD review: "If I'd Been Born an Eagle"
Even given the enormous and growing popularity of all things "world beat," Huun-Huur-Tu is an unlikely American pop success story. And yet here are the famous Tuvan throat singers with their third U.S. release, "If I'd Been Born an Eagle," and still another U.S. tour to packed clubs across the land. Americans, it seems, just can't get enough of this earthy, exotic music from central Asia. Tuvan throatsinging is unlike any other musical animal. The vocalists manage to get three, four and even more tones from their throats at the same time, creating a mesmerizing series of harmonics that, when combined with the soulfulness of their folk songs, is utterly captivating. Adding to the exotic sound of the CD are the stringed instruments the band members use to accompany themselves, instruments like the doshpuluur. Long-necked with a small body, they look like a cross between a banjo and a lute. The band is also accompanied on flute and an organ or accordion (the instrument names are given in Tuvan, so it's kind of hard to know exactly what you're hearing unless it was mentioned in the liner notes). Of course, just as Swiss singers don't always yodel, nor do the singers of Huun-Huur-Tu always "throat sing." There are straight-ahead, Western-style vocals in their folks music from the Central Asian highlands as well. (Tuva is a small autonomous region of Russia tucked between Russia and Mongolia.) At times, Tuvan music sounds remarkable like Eastern European folk, which the band members attribute in the liner notes to Russian influences during the Soviet occupation. Whether with the multiple harmonies of throat singing or on something more accessible to Western ears, though, Huun-Huur-Tu always sing with passion and soul.